The FS 5000 is a fully-automatic freight and pallet dimensioner, offering NTEP-certified dimensioning at a fraction of the cost of other pallet dimensioners. 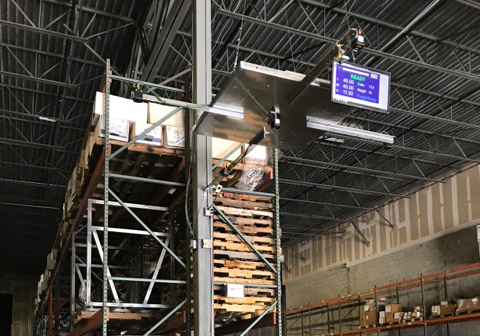 Manufactured in the United States, the FS 5000 features a sturdy aluminum frame, no moving parts and is designed to hang conveniently from the ceiling in virtually all warehouse and shipping/receiving dock settings. Units can be customized to your process, and software can be integrated with your systems for greater efficiency and flexibility. 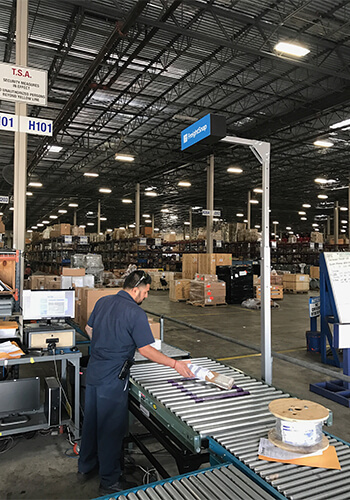 When you’re ready to talk dimensioning, start with the pallet dimensioner that’s already trusted by some of today’s top shippers and carriers. Start with the FS 5000 from FreightSnap. Contact us for more information. The FS 5000 uses the latest in 3D sensor technology to deliver consistent, accurate measurements of cubic and irregular shaped freight. Its ability to handle a wide range of freight sizes make it a popular investment with LTL carriers, shippers, freight forwarders and 3PLs. Larger, custom measuring solutions also available. Contact us for details. Width: 96" | Height: 96" | Length: 96"
Width: 12" | Height: 12" | Length: 12"
Despite its lower price tag, the FS 5000 is built to perform. When compared with pricier pallet dimensioners in its class, the FS 5000 offers the same level of performance and consistency. In addition, the FS 5000 can be integrated with most TMS, WMS and back office software applications, allowing you to use the information you’re collecting to achieve your desired business goals. The FS 5000 pallet dimensioner installs easily in most warehouse and shipping settings. 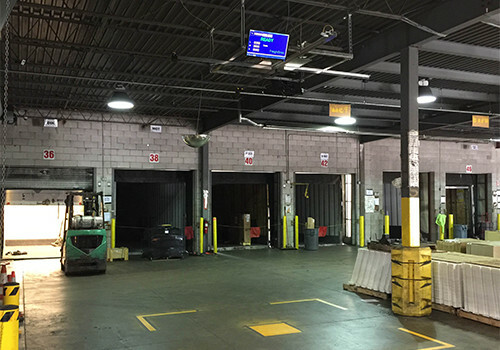 In many cases, customers require customization to maximize efficiency and/or incorporate additional equipment, including freight scales, pallet wrappers, conveyor systems, etc. When you’re ready to discuss the available options and determine the kind of setup that will work best for your business, contact us. 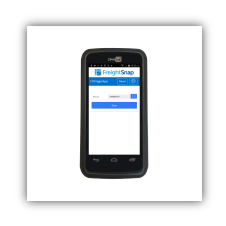 FreightSnap offers three options for storing the data collected by your dimensioner. A brief description of each is listed below. For more detailed information, visit our data storage and management options page. You may also contact us at any time with questions. Send your data to a private account on our shared cloud. 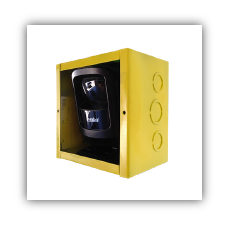 Storage is hosted and managed by FreightSnap. Send your data to a private cloud exclusive to your business. 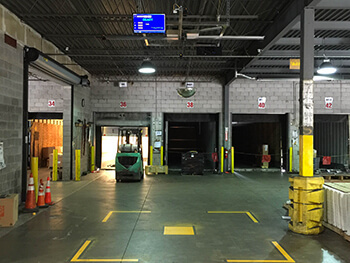 Storage is hosted and managed by FreightSnap. Send your data directly to your company’s servers. Hang a scanner from the ceiling near your dimensioner. 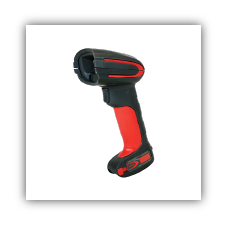 This lets forklift operators trigger the dimensioner without leaving the fork. 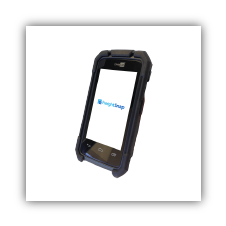 Trigger the dimensioner using a wired handheld scanner connected to your forklift’s on-board computer. 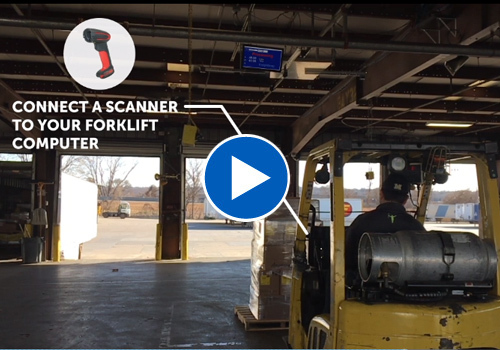 Outfit each forklift with its own bluetooth-enabled scanner for another quick and convenient way to trigger scans without getting off the fork. Don’t use barcodes? No problem. Use our triggering app to manually trigger the dimensioner from a tablet or computer.